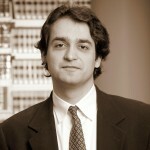 John Tehranian is an author, academic and attorney. He is the Irwin R. Buchalter Professor of Law at Southwestern Law School and the Biederman Entertainment and Media Law Institute. He is also a founding partner of One LLP, an intellectual property and entertainment litigation firm with offices in Santa Monica and Newport Beach, California. In the course of his legal practice, he has represented Hollywood, publishing, new media and technology clients and handled numerous high-profile lawsuits, from the alleged infringement of Winston Churchill’s speeches, an ownership dispute over the recording of Jimi Hendrix’s last major concert, and publicity rights over the names and images of Bette Davis and Bettie Page to fair use rights to Britney Spears photographs, remake rights to a Jules Verne novel and political parody rights to a Don Henley classic. A graduate of Harvard University and Yale Law School, Mr. Tehranian began his legal career at O’Melveny & Myers LLP. He has previously served as a tenured Professor of Law at the University of Utah, S.J. Quinney College of Law, and as a Visiting Professor of Law at Loyola Law School. Mr. Tehranian is the author of dozens of articles on the interface between law and culture, with a particular focus on issues of intellectual property, entertainment, and civil rights. His is also the author of two books, Infringement Nation: Copyright 2.0 and You (Oxford University Press, forthcoming 2011) and Whitewashed (New York University Press, 2009). A frequent commentator for the broadcast and print media, he has appeared on such television programs as ABC’s Nightline and has been quoted as an expert on legal issues in such publications as The New York Times, Harper’s Magazine, Financial Times, Los Angeles Times, Hollywood Reporter and Christian Science Monitor.